When the Land Transport Authority (LTA) announced in Jan this year, that a proposed new 50km MRT line that starts from Changi and ends in Jurong will be ready by 2030, it raised more than just eyebrows amongst the nature community. The new east-west MRT line's alignment will bring it right across the MacRitchie Forest, which falls within the boundaries of what is traditionally known as Singapore's "nature reserves". Although the LTA clarified that the line will be well below ground, it did not manage to convince the nature community that in the process of constructing the line, there will be no impact to the environment and delicate habitats within the nature reserves. From the viewpoint of the engineers and the economists, the alignment of the Cross Island Line (CRL) will take the most technically efficient and economically pragmatic route, which will cut across the narrowest portion of the Central Catchment Nature Reserves (see map). 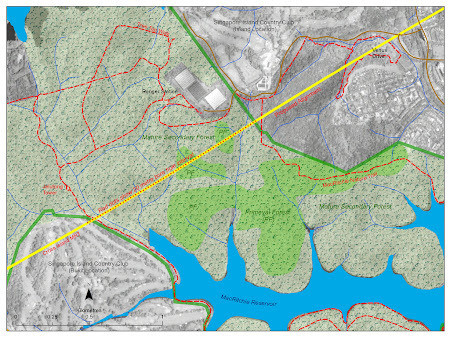 As the line will be completely below ground, it was also assumed that the impact to the forest habitats above would be "minimal". The Common Faun (Faunis canens arcesilas) a forest denizen that is not found outside of the nature reserves nor is seen in urban parks and gardens. Much has been debated about the potentially damaging and irreversible impact to the flora and fauna that may be caused by the CRL, so I won't delve into the details of those arguments. We have been asked about how butterflies could be affected by habitat changes that may be caused by the CRL and the construction activities that are associated with the line. 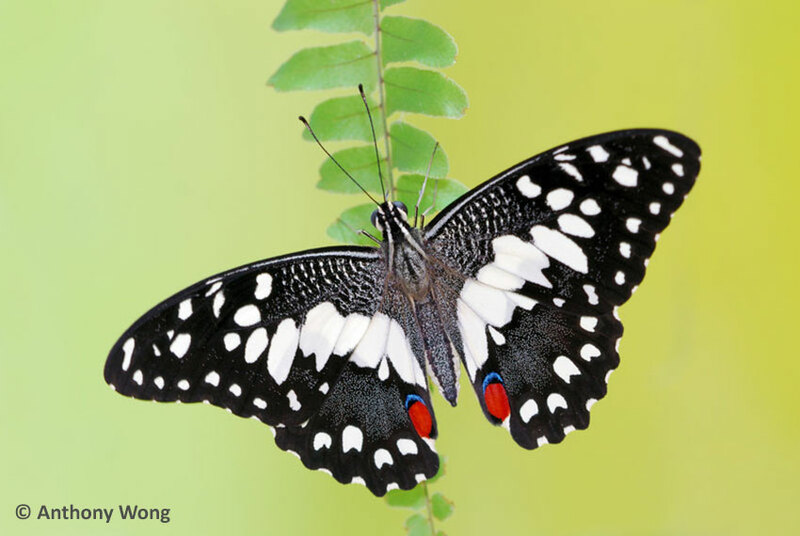 As butterflies are mobile and can fly to other areas, why would any changes in the MacRitchie Forest environment threaten them? The host plant specificity of the early stages of butterflies makes them particularly vulnerable to changes in plant diversity due to changes in land use and loss of their host plants. 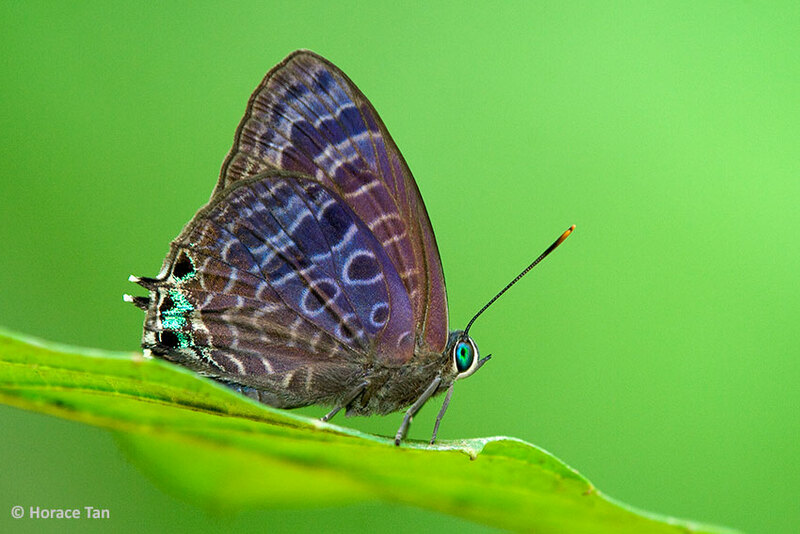 The information on the host plants of butterfly species in Singapore is largely incomplete. 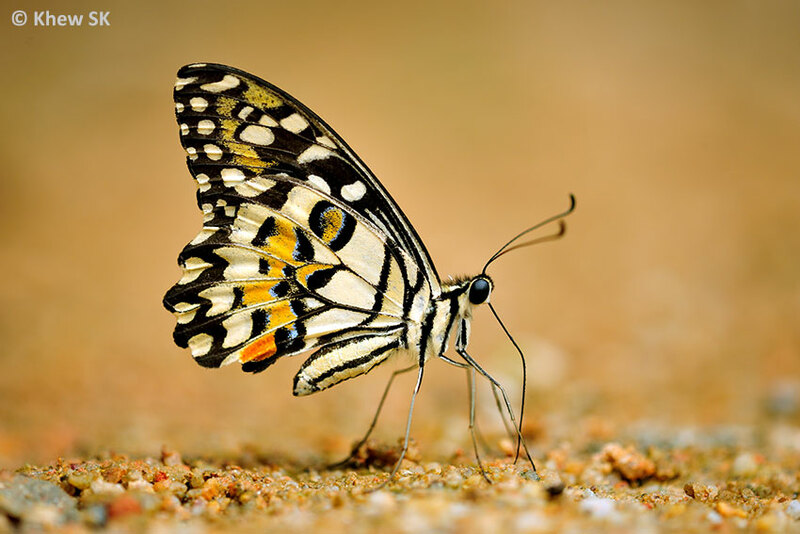 Although butterflies are able to fly from location to location in search of their caterpillar host plants, it is not known for certain why certain species have gone extinct. 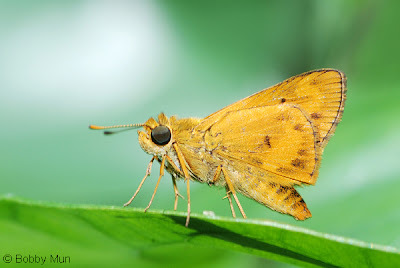 Some species may go extinct sooner than their host plants when the relative rarity, and not absolute disappearance, of certain host plants reduce butterflies to below their minimum viable populations. 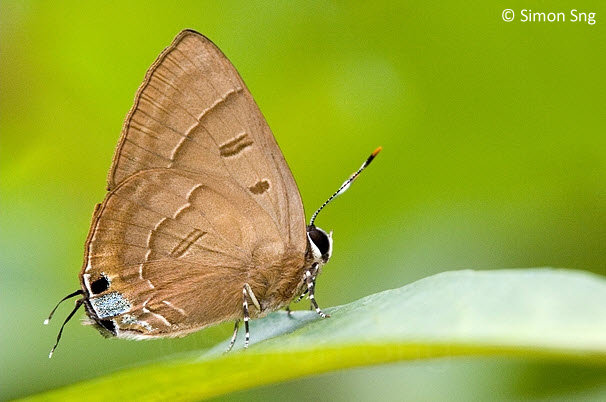 Coupled with predation, environmental factors and loss of habitats, some species of butterflies may have gone extinct long before their host plants actually disappear from our forests. The unpredictability of the extent of damage that starts with the soil investigation works and how the plant diversity and the associated habitats will change and adapt through the construction period, tunnelling and eventual changes in water table will form the major part of the risk of undertaking the CRL. Whilst the tunnelling work is assumed to have minimal visible impact at the ground level within the nature reserves, very little is known about how the water table changes when an impervious concrete tube is built - spanning up to 20m across and running a few kilometres across the nature reserve, some 40m or more below the surface. Many of the larger trees may suffer due to the changes in the water table, and if they die out, the drying out of the forest in that area will spread unpredictably, and may cause damage of untold proportions. Such changes in the forest may threaten some of the host plants and hence the related butterfly caterpillars that feed on them. It is estimated that at least 60% of Singapore's butterfly fauna are forest-dependent. Whilst the increase of urban planting and landscaping strategies to attract butterflies in urban areas have begun to bear fruit, the same cannot be said for forest butterflies. 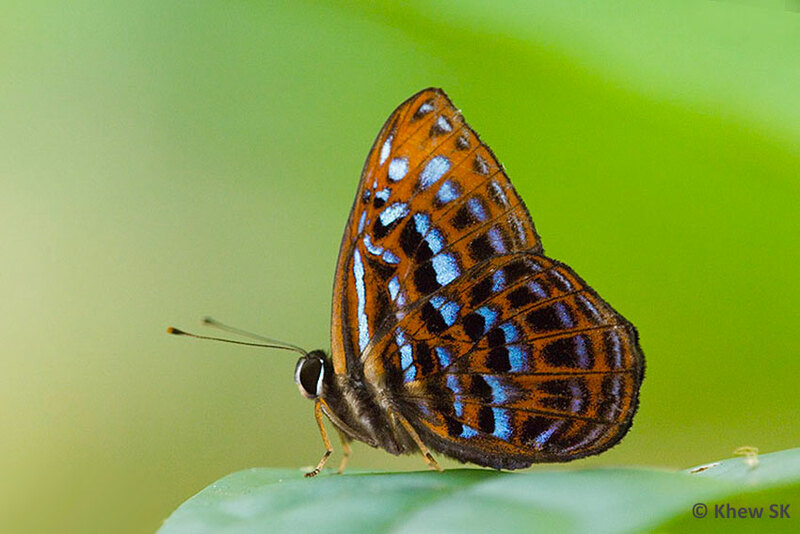 Many of the forest-dependent species will not come out to the urban butterfly gardens. Most of the butterfly species featured in this article are rarely seen in urban parks and gardens. 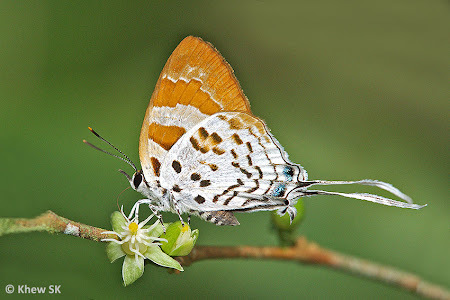 The Harlequin (Taxila haquinus haquinus) that may now be extinct on Singapore island due to the destruction of its habitat in the north-western part of Singapore. Attempts to translocate it to other sites have not been successful. Even if their caterpillar host plants are available, these butterflies' preferred habitats have to be conducive to support a sustainable population. Not enough is known about why certain species prefer particular locations whilst other similar habitats elsewhere do not attract the same species. 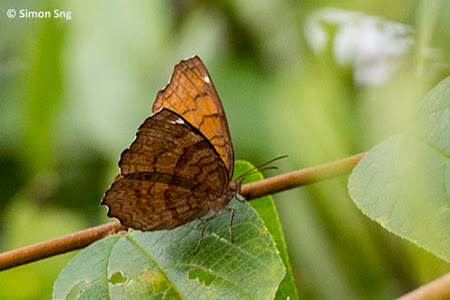 An earlier attempt by ButterflyCirle to translocate the Harlequin (Taxila haquinus haquinus) at a forested site that was threatened by development was unsuccessful. Whilst a few sites were chosen, that were similar in terms of habitats and availability of host plants, there were no signs that Harlequin survived in the new locations after a period of monitoring. 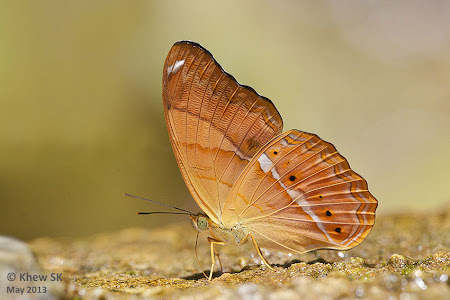 Around the MacRitchie Forest area, there are records of some rare species of butterflies that are found in the forested area and a few have only been observed in that area and nowhere else. 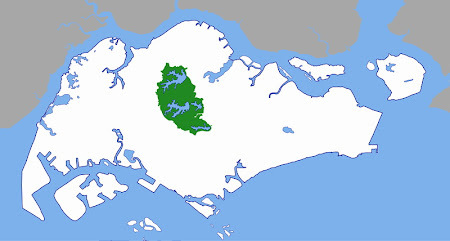 If their habitats or host plants are affected, there is a high risk that these species may face extinction in Singapore. It is encouraging that the LTA has confirmed that an Environmental Impact Assessment study will be carried out over the next two years, starting in early 2014 to assess the potential environmental impact caused by the CRL. Will the study recommend that the CRL be realigned outside the Nature Reserves? Or will it support the current alignment but with strict mitigation measures be put in to minimise damage to the MacRitchie Forest? 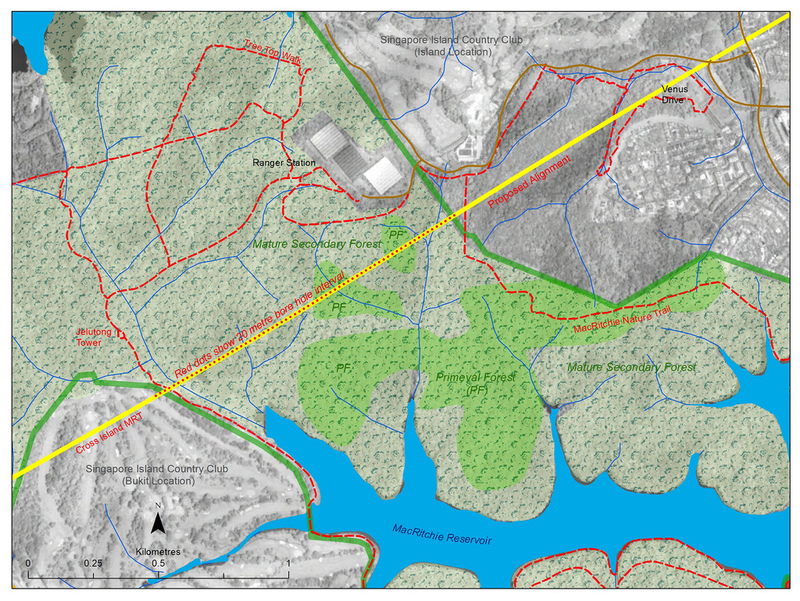 How deep should the tunnels be constructed, where it will not cause any changes or damage to the forest ecology? We have to acknowledge that we do not know. But a general rule of thumb in tree biology points out that the tap roots of large trees like Dipterocarps can reach as deep as the height of the tree itself. That would mean that a 30m tree would have roots reaching 30m or more below ground. Would a tunnel that runs below such trees affect the health of the forest? Has it been done elsewhere before? Should we even try? As to the fate of our forest butterflies, if the CRL were to proceed as planned, we cannot say for sure - we do not know enough. 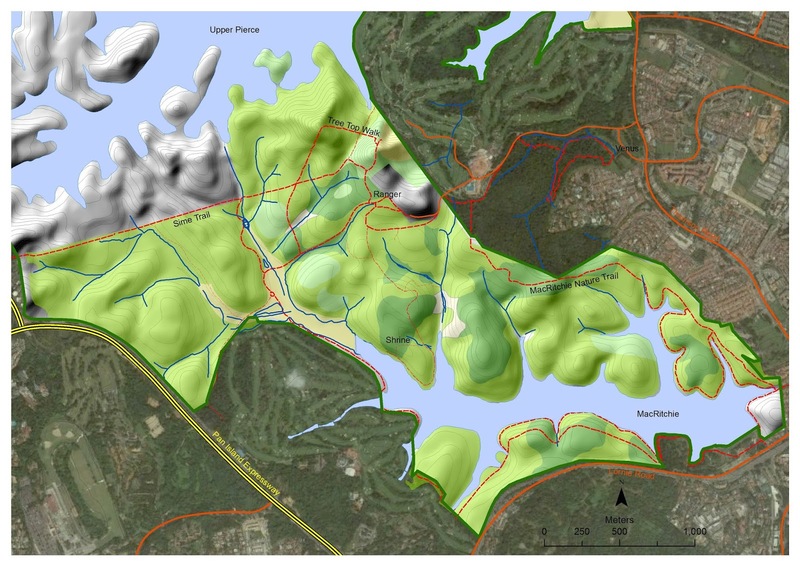 The CRL appears to be a rare project that has breached the previously-assumed impenetrable gazetted nature reserves in Singapore. True, there have been other structures like the military facilities or water treatment plants sited within the nature reserves, but none so recent nor extensive as to generate quite a bit of controversy and grab the attention of the nature community in Singapore like the CRL. 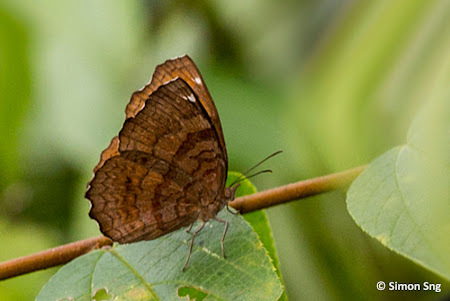 The Purple Duke (Eulaceura osteria kumana) - common but forest dependent. 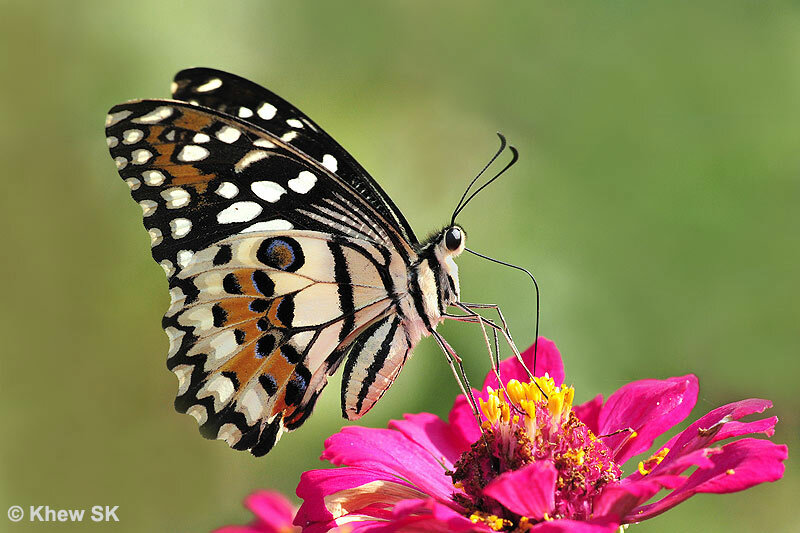 Can such a butterfly be attracted to urban habitats like our parks and gardens with judicious planting of its host plants? Apparently not. Are there no other alternatives to the alignment that LTA has proposed? The NSS has come up with a position paper that says otherwise. Will the alternative route be still technically possible but will come at a great financial cost to the government? How would that expenditure stack up against the nature reserves which some consider as 'priceless' and it would be futile to even put a value to? Are there any compromises that can be made? Both sides will have to keep an open mind to options. Are we courageous enough to gamble with a part of the 'green heart' of Singapore and stand to lose a part of our natural heritage and sacrifice a legacy to our future generations? We should know the recommendations of the EIA in early 2016, and the fate of MacRitchie Forest then. At that point in time, we hope that we will make a wise decision for the greater good of all Singaporeans and the flora and fauna that share our little island with us. 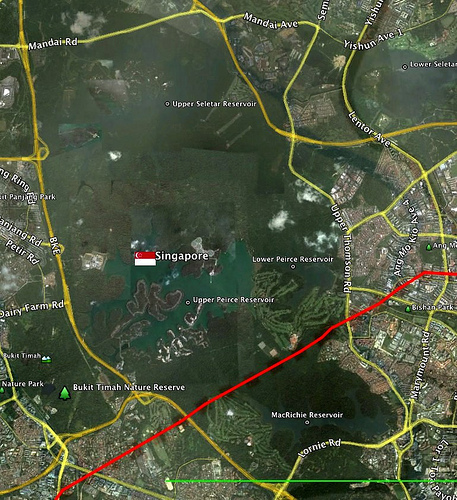 Lazy Lizard's Tales : The Cross-Island Line: why does it have to go through a Nature Reserve? 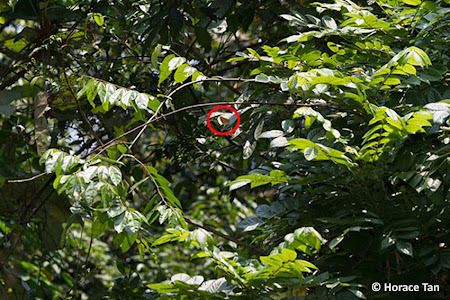 Love MacRitchie Forest : Where's the Problem? Koh, L.P. & Sodhi, N.S. 2004. 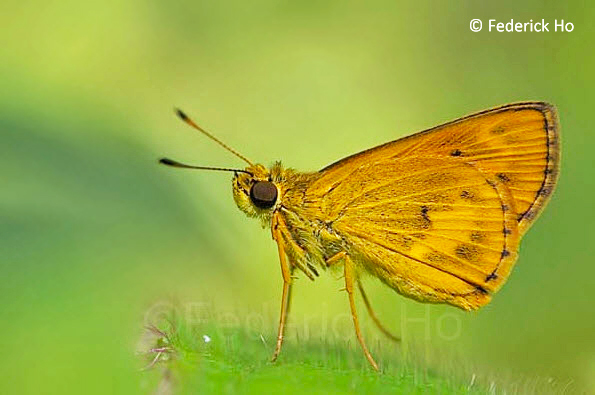 Importance of reserves, fragments and parks for butterfly conservation in a tropical urban landscape. Ecological Applications, 14, 1695–1708. Koh, L.P., Sodhi, N.S. & Brook, B.W. 2004a. 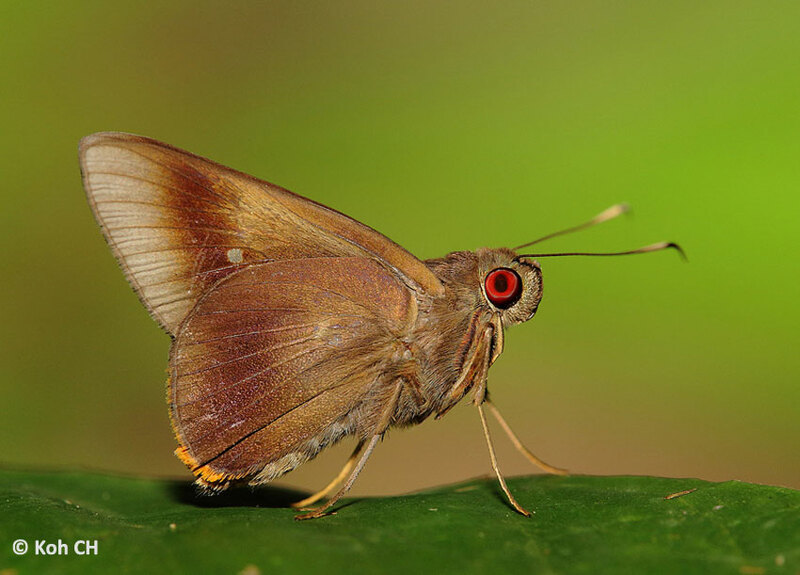 Co-extinctions of tropical butterflies and their hostplants. Biotropica, 36, 272–274. This skittish Satyrinae often lurks in the shaded areas in the vicinity of bamboo clumps and remain well camouflaged until it is disturbed. 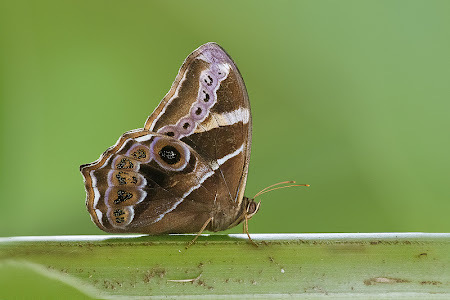 In freshly eclosed individuals, the large violet submarginal ocelli on the underside of both wings are very attractive. The species is uncommon, but not rare. It is local in distribution and usually found in the vicinity of its caterpillar host plant - bamboos. This Bamboo Tree Brown was photographed by young ButterflyCircle member Jonathan Soong at the Butterfly Hill on Pulau Ubin last Sunday. For this species, a butterfly photographer has to be very patient in stalking it, especially when the butterfly is extremely alert and skittish, and prefers to stop amongst dead leaves and forest litter at low levels. Over here in Singapore, the large flower of the Hibiscus (Malaysia's national flower) does not appear to attract butterflies very often. 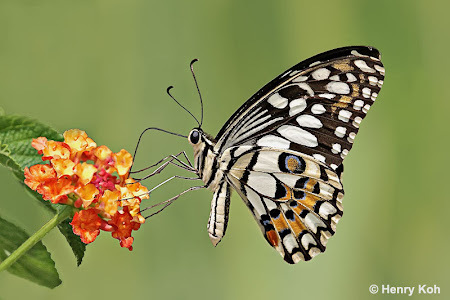 Is it because there are other more nectar-rich flowers around that makes a butterfly simply avoid the Hibiscus? 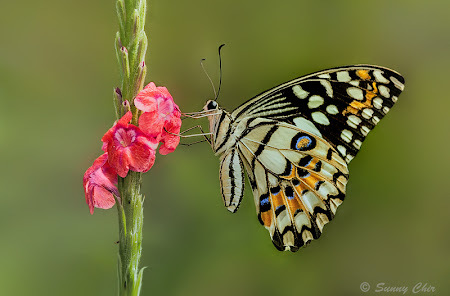 However, at the Butterfly Hill on Pulau Ubin last Sunday, we saw a number of large butterflies, like this Great Mormon, feeding on the Hibiscus flower. 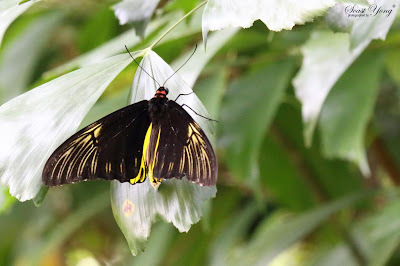 Amongst the other species are the Common Birdwing, Common Mormon and Orange Emigrant. 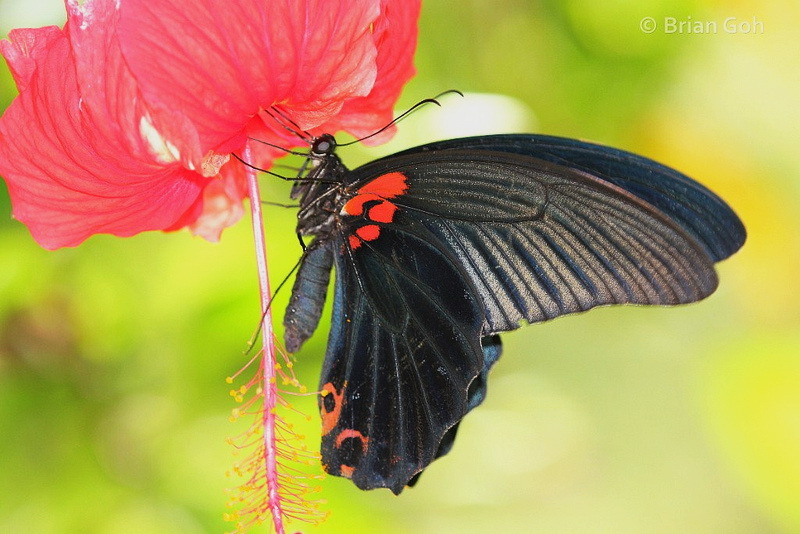 This male Great Mormon, shot by young ButterflyCircle member Brian Goh, is shown probing deep into the Hibiscus flower with its proboscis for nectar. 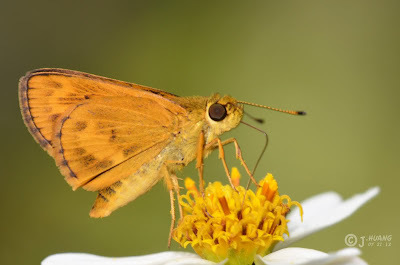 There were certainly other flowering plants around in full bloom that day, like the Ixora, Lantana, Bidens, Wedelia, Stachytarpheta and Cordia planted at Butterfly Hill. So, why did the Hibiscus suddenly become so attractive to the butterflies? Readers are invited to share their observations and experience here. This "Eggfly" occurs as two different subspecies in Singapore - Hypolimnas bolina bolina (known as the Great Eggfly), and Hypolimnas bolina jacintha (known as the Jacintha Eggfly). 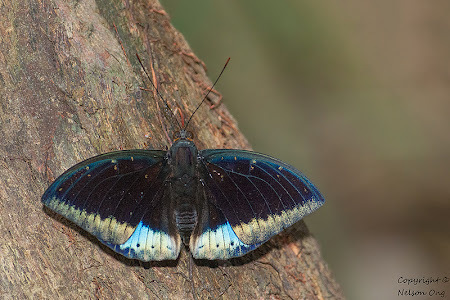 Whilst the females of the two subspecies are relatively easier to distinguish, the males are almost indistinguishable and look very similar in appearance. It would be quite interesting to ascertain if the two subspecies can interbreed, and whether they are evolving into a single species or otherwise. 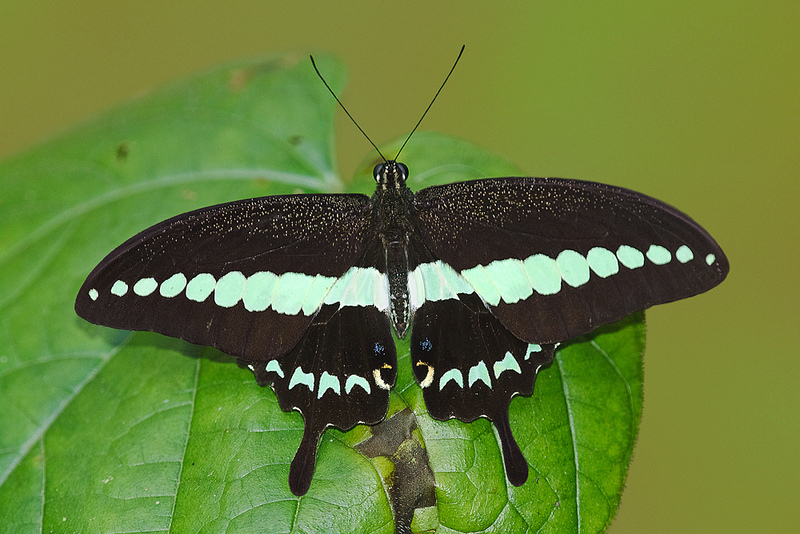 The submarginal white chevron markings on the underside of the hindwing were used to distinguish between ssp bolina and ssp jacintha. However, intermediates are beginning to show, and rendering this physical diagnostic attribute unreliable to separate the two. These two Eggfly subspecies should be observed closely to see whether they eventually separate more distinctly or merge into a single subspecies. Caterpillar Local Host Plants: Mangifera indica (Anacardiaceae, common name: Mango), Hibiscus tiliaceus (Malvaceae), Syzygium zeylanicum (Myrtaceae), Mallotus paniculatus (Euphorbiaceae, common name: Turn-in-the-wind) and Saraca thaipingensis (Fabaceae, common name: Yellow Saraca). 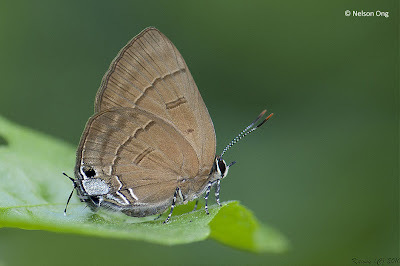 On the upperside, the male is mostly dark reddish brown, and the female is dull steely blue. 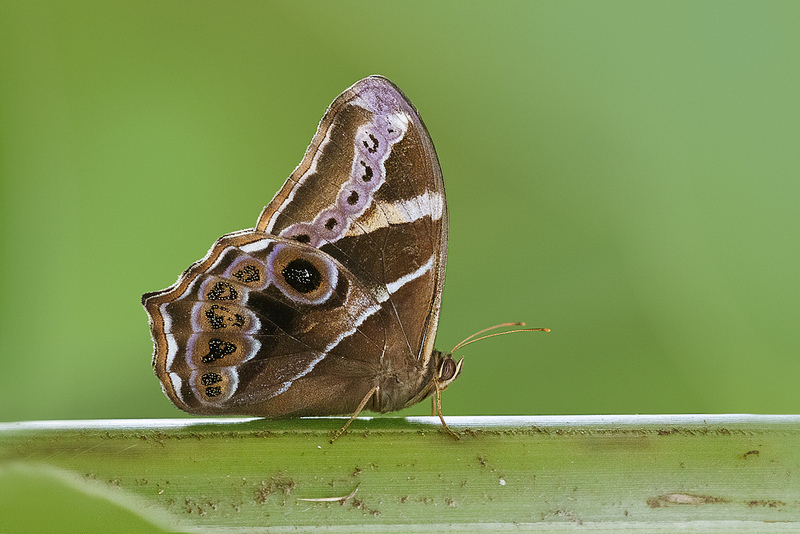 On the underside, both sexes are pale brown. Both wings have a broad cell-end bar and a brown post-discal band which is whitened on the outer side. 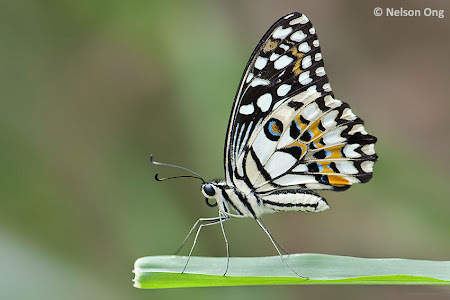 The forewing has a spot in the middle of the forewing cell (which could be absent in some females). The hindwing has a black marginal spot in space 2 and another on the tornal lobe. Between the two spots, the marginal area in space 1b is covered with bluish scaling. There is a white-tipped tail at the end of vein 2. The legs are white and black-banded. This species is moderately common in Singapore and can be found in serveral urban parks and nature reserves. The adults are fast flyers and make rapid sorties among foliage. Both sexes have been observed to visit flowers of various plants for nectar. Another sighting of this giant birdwing! 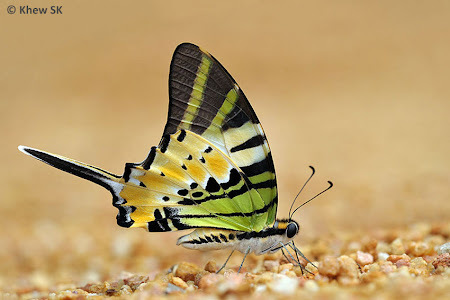 Back in March 2011, I found the caterpillar of the Malayan Birdwing (Troides amphrysus ruficollis) at Alexandra Hospital. It was recorded as a re-discovery and species #301 in the Singapore Butterfly Checklist. 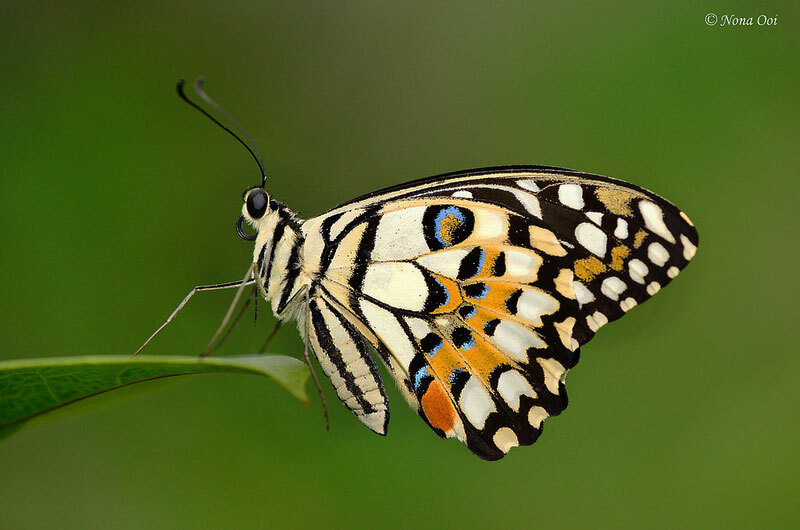 After that, there appeared to be no reliable sightings of this gentle giant butterfly until now. Last weekend, ButterflyCircle member Yong WH managed to encounter the Malayan Birdwing again! This time, a male was spotted perched on some leaves of the Fishtail Palm, taking a rest. It is hoped that with more schools and gardens cultivating one of its host plants, Aristolochia acuminata, this magnificent Birdwing will fly in our Singapore skies again. The month of November is upon us all too soon! The 2nd of November 2013 saw the 400,000-plus Indian community in Singapore celebrating Deepavali (or Diwali, which marks the beginning of the Hindu New Year according to the Lunar Calendar. Also known as the Festival of Lights, Deepavali celebrates the victory of Goodness over Evil and Light over Darkness - as it ushers in the new year. Over in the Philippines, what is believed to be the strongest tropical cyclone ever recorded to make landfall struck the areas covering Biliran Island, Eastern Samar, Leyte, northern Cebu, Samar, Southern Leyte and Luzon. The city of Tacloban in Leyte was badly hit by the 310 km/hr winds, and the estimates of casualties numbered in the thousands. The category 5 "super typhoon" Haiyan has come and gone, leaving entire communities decimated in its wake and the survivors have just begun the potentially long and traumatic process of getting their lives back to normalcy again. Our sympathy and prayers go to all those affected. One wonders if these extreme weather phenomenon that we experience today is attributed to the process of climate change and global warming? Even in Singapore the weather patterns that have changed over the past few years leaves one wondering if the designs of our infrastructure and buildings would be able to withstand the onslaught of heavy rains and strong winds. Already, unprecedented flash floods in some areas of Singapore have required the government departments to expedite the drainage works to accommodate the inundation of our little island with the intensity and volume of rainfall rarely encountered in the past. And there will certainly be the debates on whether the extent of deforestation in many countries will continue to increase, leaving the cleared land even more vulnerable to extreme weather conditions. Singapore, our little 712 sq km island nation has been spared natural disasters like typhoons, tsunamis and earthquakes so far. But if we were to be affected one day, will we be ready? Over to our Butterfly of the Month for November, we feature the humble and common urban butterfly, the Lime Butterfly (Papilio demoleus malayanus). Attractively coloured with black and pale yellow markings on the upperside forming an irregular band running from the forewings to the hindwings. 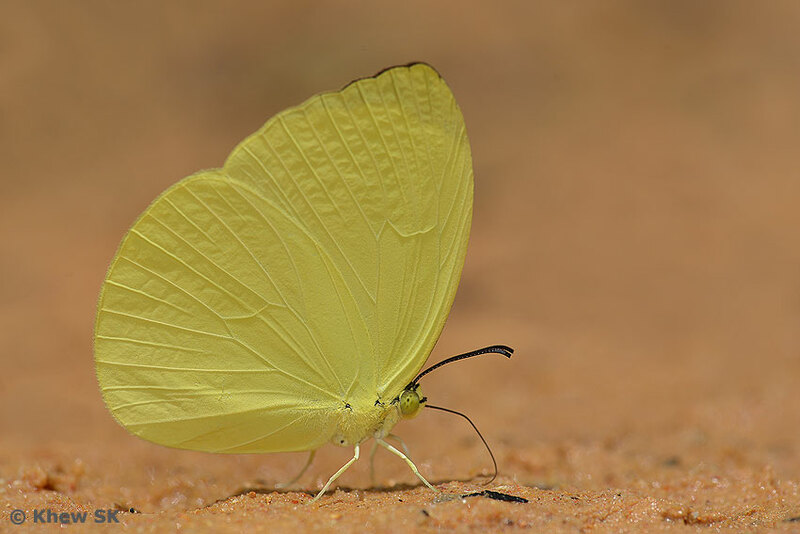 The underside is pale yellow with black markings. 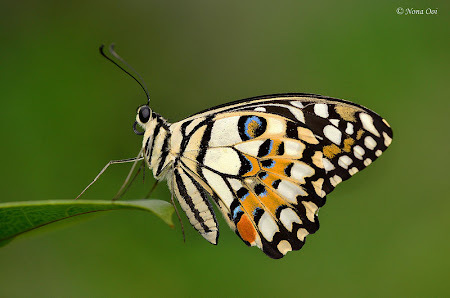 Both sexes are mostly yellow with black streaks and irregularly-shaped spots. 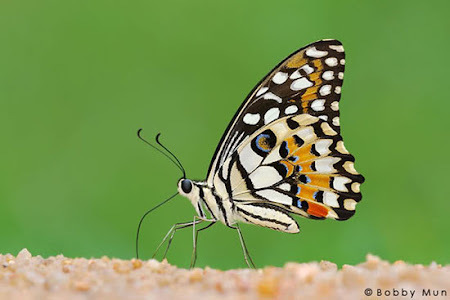 On the hindwing, several black spots are lined with blue striae. 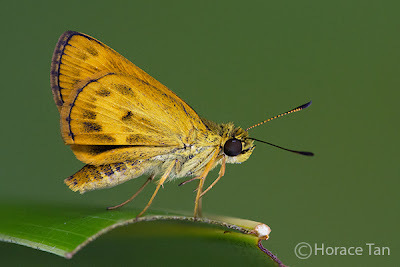 There is a series of orange post-discal bars on both hind- and forewings. The sexes are very similar. 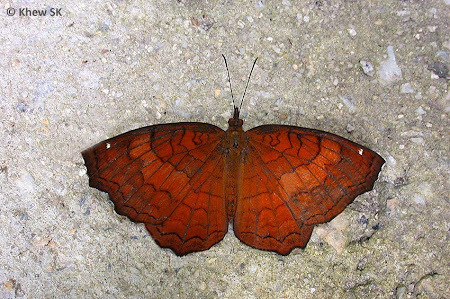 The distinguishing characteristic can be found in space 1b on the hindwing. There is a red spot in both sexes. In the male, this spot is capped with a narrow blue lunule with a very narrow intervening black gap. In contrast, the red spot and the blue lunule in the female have a rather large black spot between them. 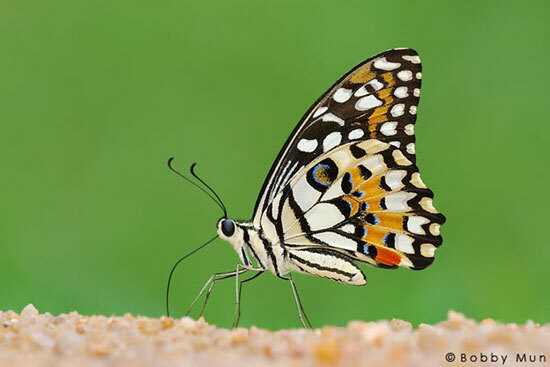 Like in all Papilionidae, the Lime Butterfly has all six legs fully developed. The eyes are 'opaque' and jet black. 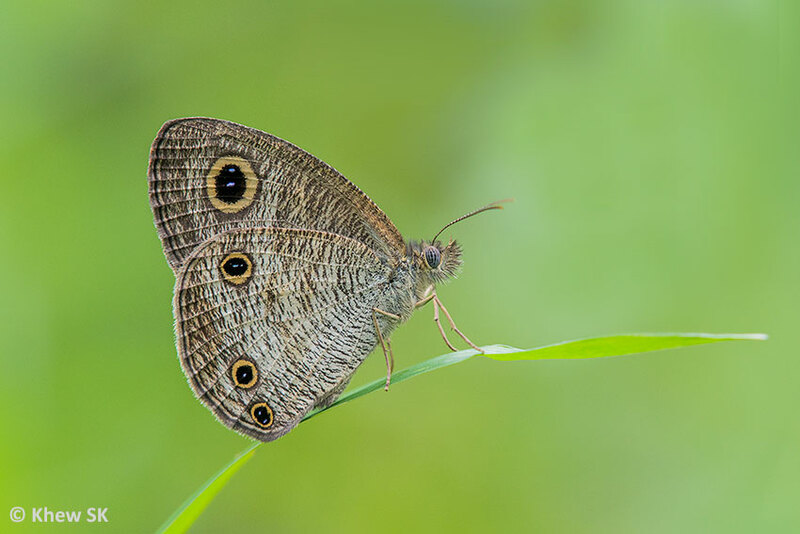 The Lime Butterfly is a fast flyer and its rapid and erratic flight makes it very challenging to shoot whilst in flight, although not impossible. There have been excellent shots taken by ButterflyCircle members where the Lime Butterfly was photographed in mid-flight whilst feeding on flowers. 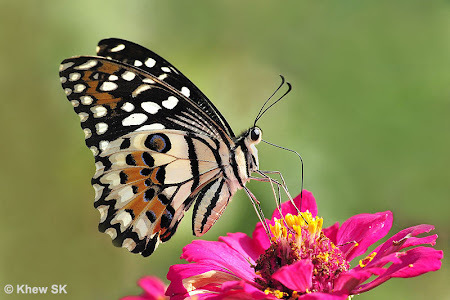 At times, the butterfly stops to rest amongst shrubbery, either with its wings folded upright, or opened flat to sunbathe. 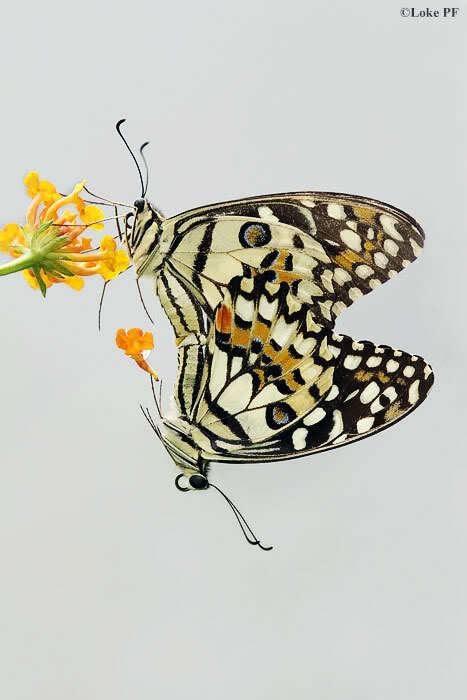 It is common in urban areas where its caterpillar host plants - mainly the Citrus spp., are cultivated. It has several alternative host plants, largely from the Rutaceae family. Even the Indian Curry Leaf plant (Murraya koenigii) is one of the Lime Butterfly's host plants. 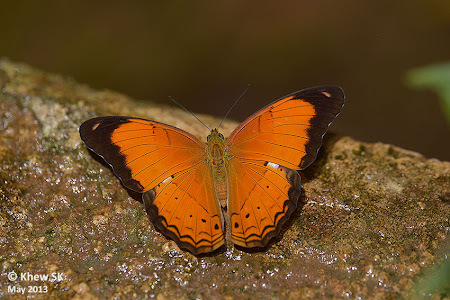 The complete life history of the Lime Butterfly has been recorded here. We have had reports of caterpillars found on a potted Citrus plant on the 13th storey of a high rise apartment in Singapore. 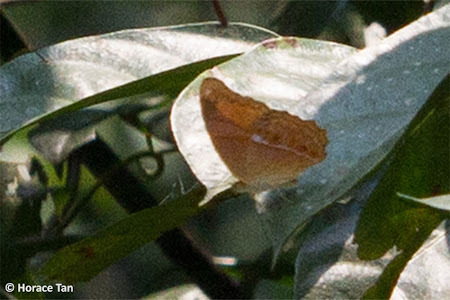 The owner was quite certain that the plant was over a year old (implying that the caterpillars were not stowaways on a new plant and brought up to that height) and placed along the common corridor of the apartment, suggesting that the visiting female Lime Butterfly flew up to that height (about 40m high) to oviposit on the host plant. 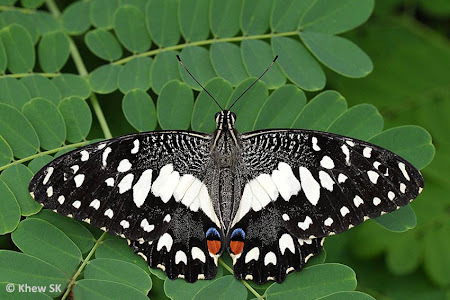 The Lime Butterfly can be found in parks and gardens, often seen feeding on Lantana and Ixora flowers, flying rapidly amongst the greenery. It is sometimes observed at the fringes of the forested nature reserves and even in the nature reserves. 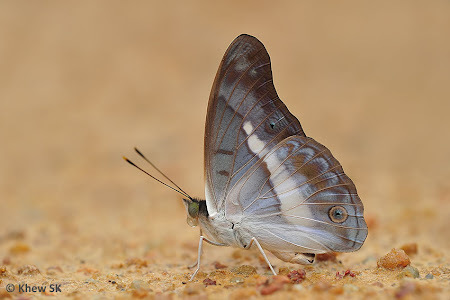 Males of the species have been observed to puddle at the sandbanks of forest streams, in the company of other Papilionidae, Pieridae and Lycaenidae butterflies. This Lycaenid was re-discovered by ButterflyCircle members in 2008 when a colony of the species was found at the now-gone Mandai Orchid Garden. As the caterpillar of this species feeds on the flower of the Torch Ginger, several other colonies of the Metallic Caerulean have been found since. A translocation attempt at the Zoo was also successful, and the species can also be found at the Zoo today. Males have a black diffuse border on the forewing above whilst the females have the forewing border extending narrowly along the costa to the base. 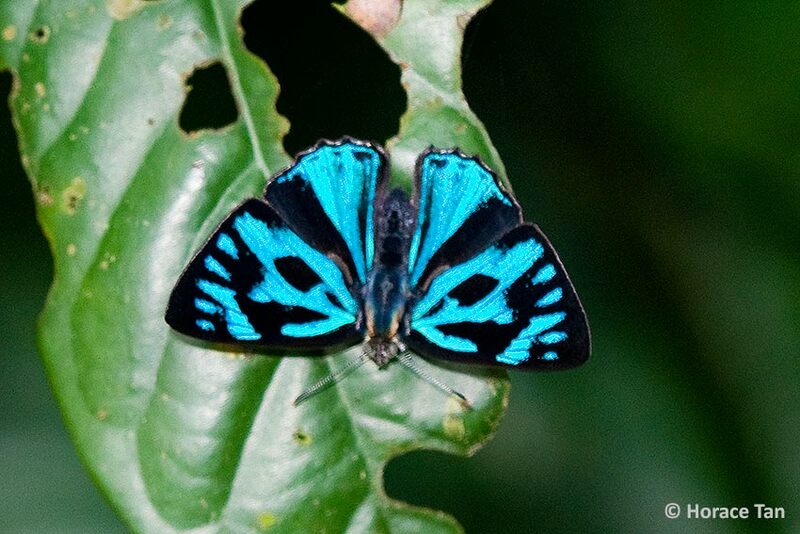 The upperside is a bright metallic light blue. The species has many lookalikes in the genus. 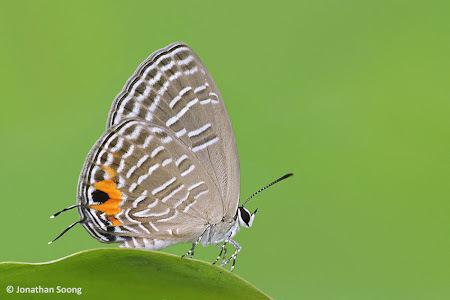 This Metallic Caerulean was photographed by young ButterflyCircle member Jonathan Soong. This pretty swallowtail is very local in distribution, and oftentimes found in the vicinity where its caterpillar host plant, Aristolochia acuminata can be found. 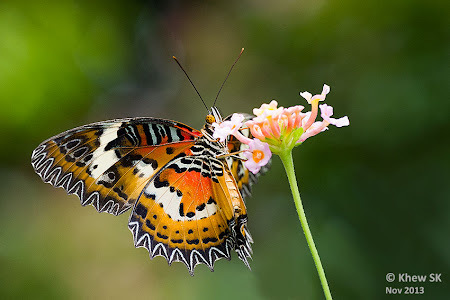 It is widely distributed, and can be seen in urban parks like the Singapore Botanic Gardens and Hort Park, as well as in forested areas and offshore island like Pulau Ubin. 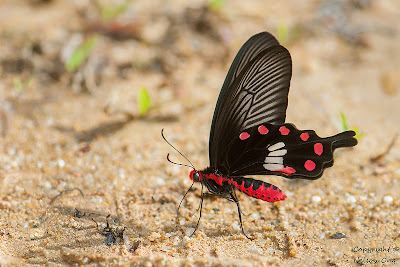 The crimson red body and marginal spots on the hindwing is a display of aposematic colouration that warns predators that it is distasteful. 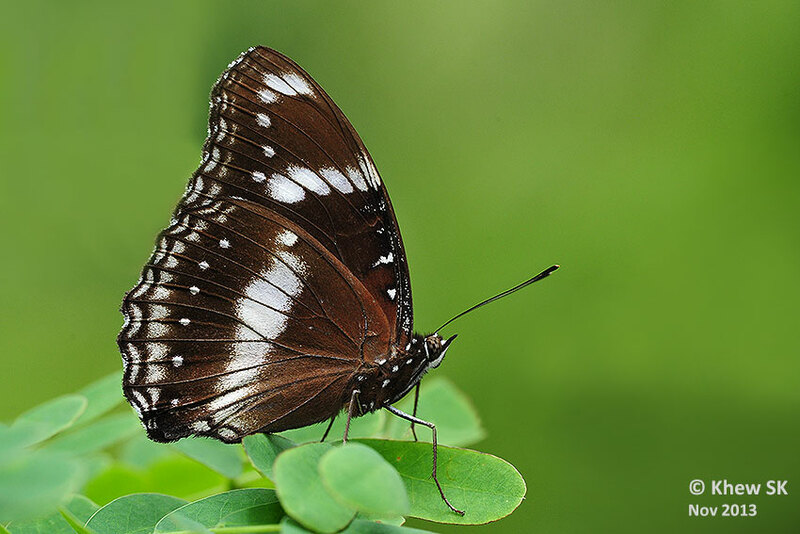 This shot, taken by ButterflyCircle member Nelson Ong, shows a Common Rose puddling - a rather rare phenomenon in Singapore, where the butterfly is more often seen fluttering and feeding at flowers, rather than puddling. Scrutinising the details of the cropped shot, the underside of the butterfly matched the Malay Yeoman. The forewing discal band which is narrow at the dorsum and widens significantly at the costa can be clearly seen. 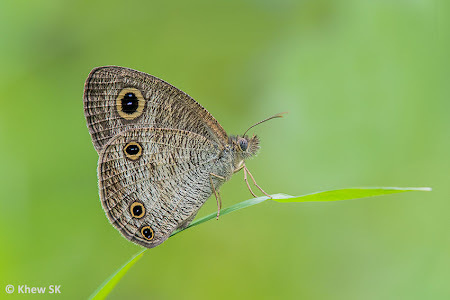 The distinguishing constriction of the discal band on the hindwing in spaces 5 & 6 can also be seen in the shot, confirming that this species is indeed the Malay Yeoman! 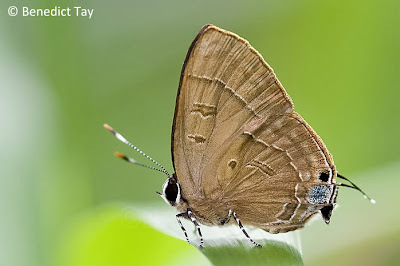 Further reference to C&P4 indicated that the Malay Yeoman was marked [S] designating it as a "species which, so far as known, have not been taken again in Singapore during the present century". (Note that the present century meaning the 20th century as the 4th Edition of the book was updated in 1992). 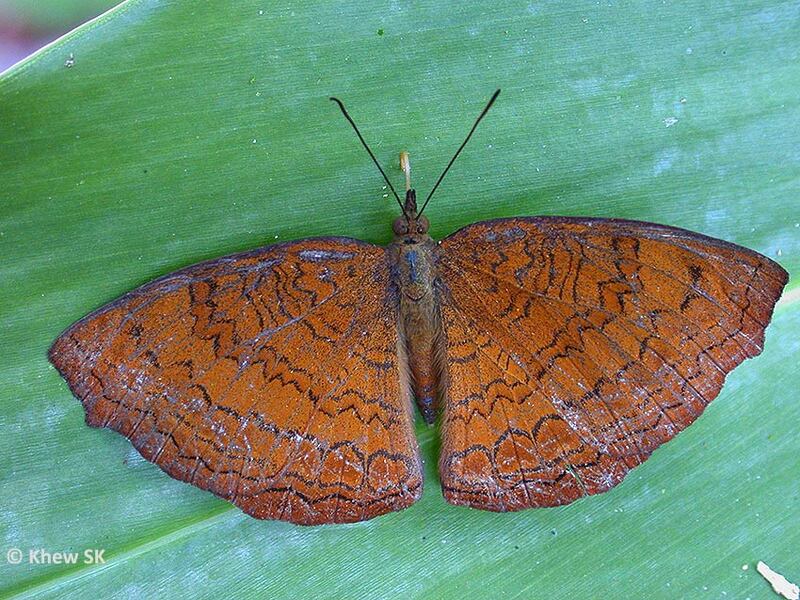 This species is described as fulvous orange above, with a black distal margin. 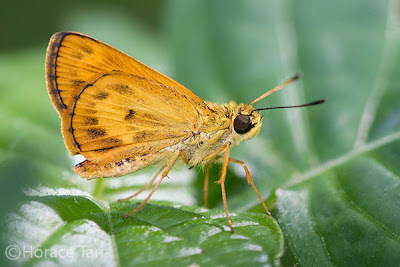 We now record is as species #307 in the Singapore Butterfly Checklist. 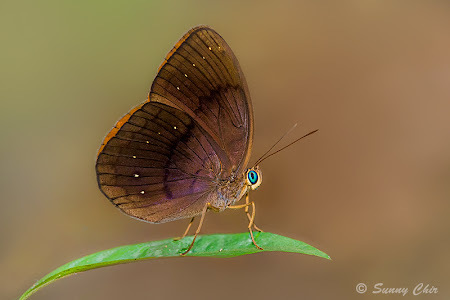 As it is a common species in Malaysia, observers should continue to look out for it in the Central Catchment Nature Reserves in Singapore, where Horace Tan saw this species. 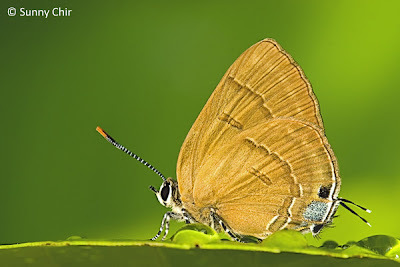 Another species that surprised members of ButterflyCircle on our regular weekend outing on 12 Oct 2013 was the Angled Castor (Ariadne ariadne ariadne). 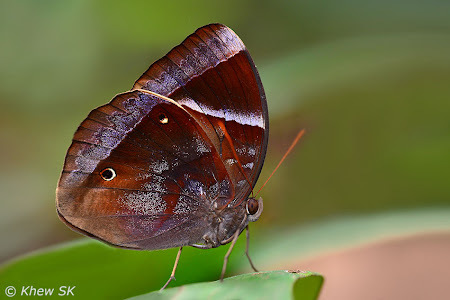 The species has reddish brown upperside traversed by sinous black lines and having a prominent white subapical streak on the forewing. The Angled Castor is described as local and found in forest clearings. 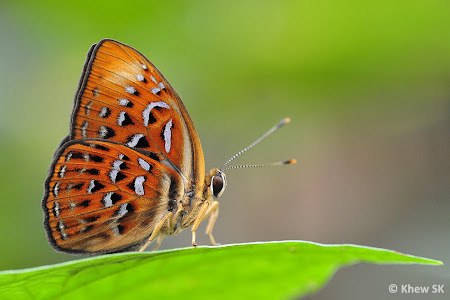 Indeed, ButterflyCircle members Simon Sng and Loke PF came across this species at a forest clearing where other species were present due to the mass fruiting of the Singapore Rhododendron (Melastoma malabathricum). Both photographers managed to take a few shots of the Angled Castor before it made its way to the treetops and disappeared. The shots shown here confirmed the existence of the Angled Castor beyond any doubt. The single black line just beyond the cell end and the white subapical spot on the upperside and underside of the forewing validates the identity of the Angled Castor. The other likely species that occurs in nearby Johor in Malaysia, is the Malay Castor (Ariadne isaeus isaeus). 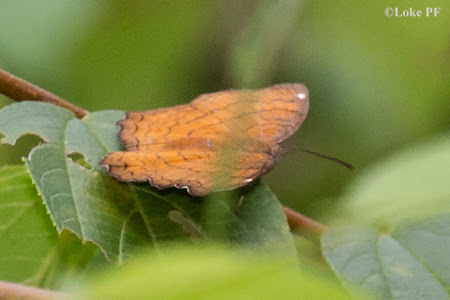 However, this species is described as having a narrow, zigzagged orange brown band just beyond the cell end of the forewing, and without a white apical spot. 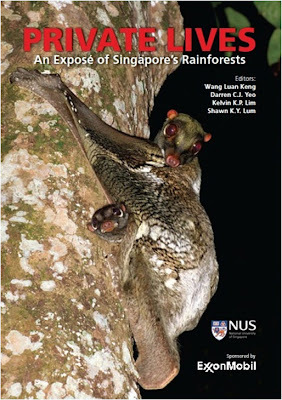 Again, a species that was encountered in the forested nature reserves of Singapore suggests that there may still be more surprises in our forests that have yet to be discovered. 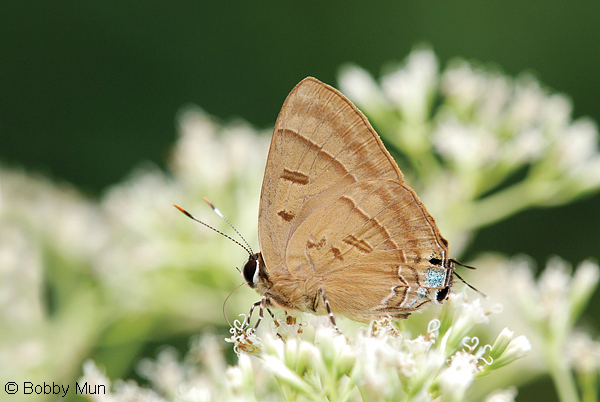 The Angled Castor is considered a re-discovery, as the C&P4 checklist indicates this species as extant in Singapore. 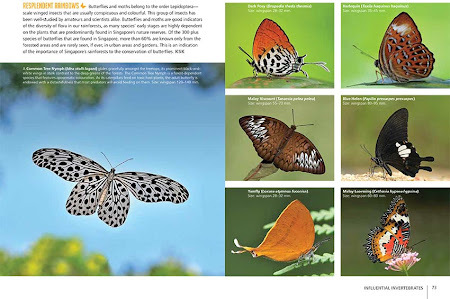 The importance of our central catchment core cannot be overstated, as it is a critical sanctuary to a diverse range of floral and faunal biodiversity in Singapore. The Angled Castor is added to the Singapore Butterfly Checklist as species #308. 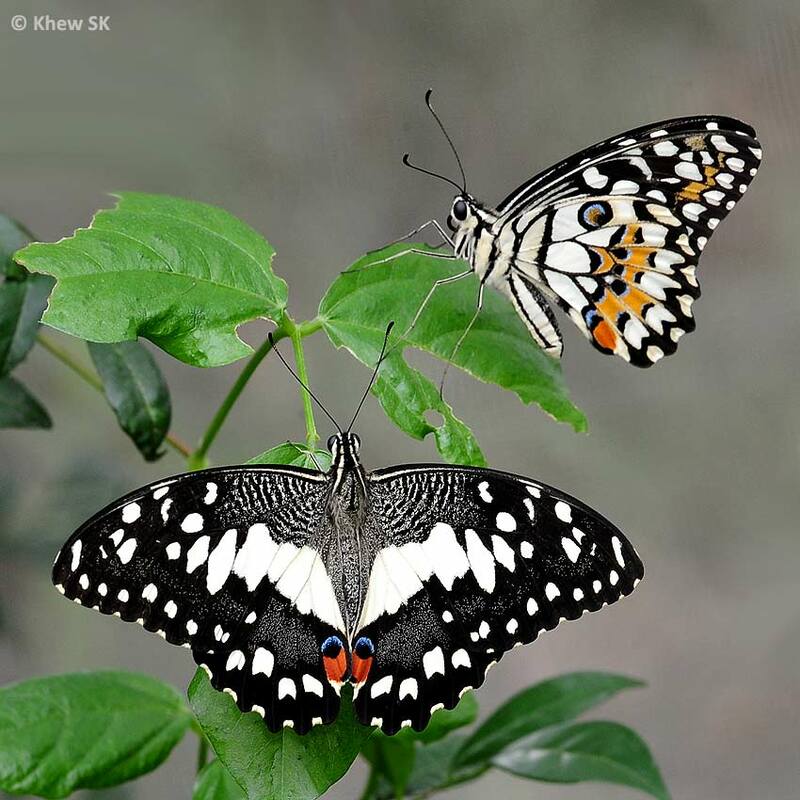 It is hoped that these two species will continue to be spotted in Singapore even though at the moment, they would be considered 'seasonal visitors'. 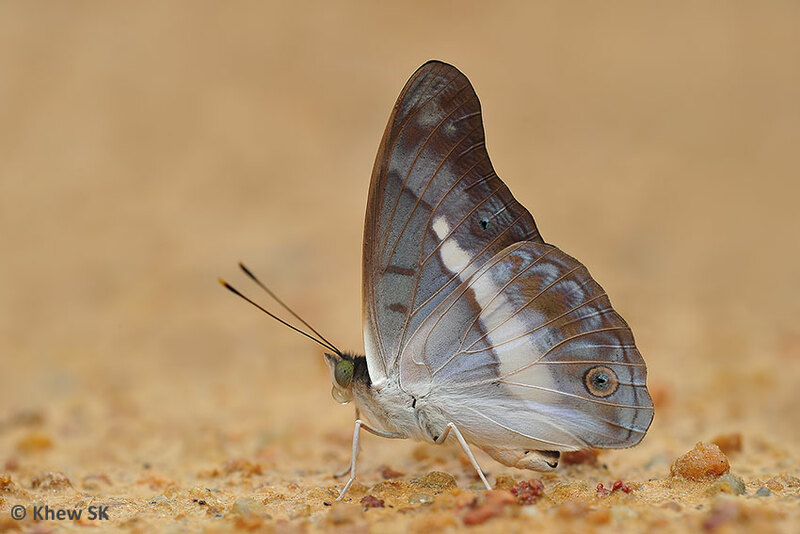 However, given the period that both have been spotted in Singapore, the postulation that these species may have been carried over by the prevailing winds from Malaysia may be unfounded. This is because the prevailing winds in the months of mid-Aug to Oct 2013, are largely from the south-west! The Singapore Butterfly Checklist is hence updated to 308 species as at end Oct 2013. 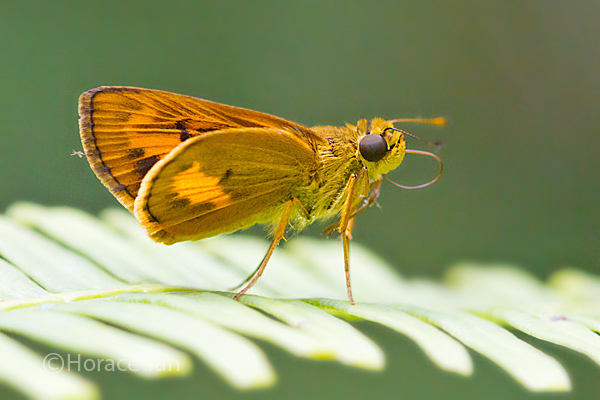 There are a number of Hesperiidae and Lycaeninae which are currently under investigations and will be added to the Singapore Checklist by the end of this year when all the validations are complete.